BOSTON (AP) Lawyers for former New England Patriots player Aaron Hernandez asked Friday for a three-month delay to the start of their client’s double-murder trial so they can review new information, including prosecutors’ disclosure that they could call team offensive coordinator Josh McDaniels as a witness. 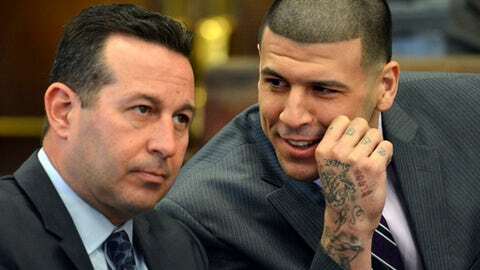 ”We are drowning here, and there is no life preserver being thrown our way,” lead defense attorney Jose Baez told a skeptical Suffolk Superior Court judge. McDaniels, with the Patriots in Houston for Sunday’s Super Bowl against the Atlanta Falcons, could testify on the possible meanings of some of Hernandez’s tattoos, prosecutors said. Prosecutors say some tattoos link Hernandez to the 2012 drive-by killings of 29-year-old Daniel de Abreu and 28-year-old Safiro Furtado. Hernandez became enraged after one of the men accidentally bumped into him at a Boston nightclub and caused him to spill his drink, prosecutors say. Over the objections of the defense, Judge Jeffrey Locke previously ruled that jurors will be allowed to see Hernandez’s tattoos as evidence. The defense argues the tattoos are irrelevant. It was not clear when the judge would rule on the motion to delay the trial. He has previously denied these requests. Hernandez is already serving a life sentence in prison for the 2013 killing of Odin Lloyd, who was dating the sister of Hernandez’s then-fiancee. He has pleaded not guilty to charges in the current case. Jury selection is scheduled to start Feb. 13, with testimony beginning March 1.